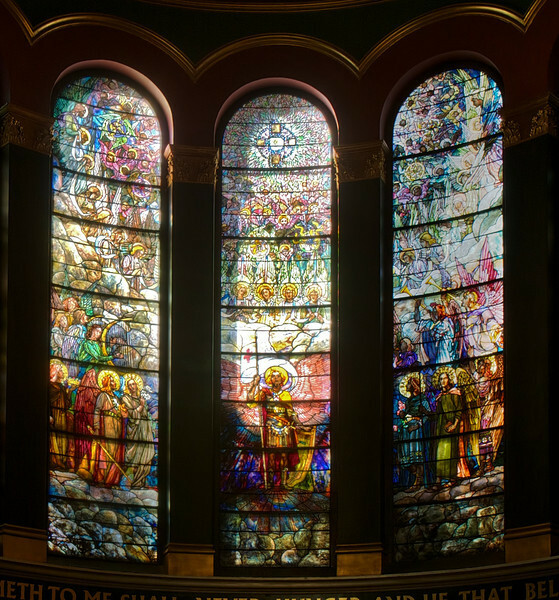 I summarized information on the Tiffany windows from a pamphlet available in the narthex (entrance) of the church, “A Brief Tour and Description of St. Michael’s Church Interior and Windows,” by church Archivist Jean Ballard Terepka. After completion of the building in 1891, Saint Michael’s rector, John Punnett Peters embarked on furnishing and decorating the church, turning to the Tiffany Glass and Decorating Company for much of the work. On Christmas Day 1895, the Tiffany windows “Saint Michael’s Victory in Heaven” were dedicated.